Author(s): Sevil Albayrak, Department of Biology, Erciyes University, Science Faculty, 38039, Kayseri,, Turkey	Ahmet Aksoy, Abit Yasar, Lutfiye Yurtseven, Umit Budak. Objectives: In vitro biological activities of methanolic extracts of five Turanecio species have been studied. Materials and Methods: The phenolic compositions of the extracts were evaluated by the Folin- Ciocalteu assay and by HPLC analysis. Antioxidant activities were determined with two in vitro assays namely, DPPH (2,2-diphenyl-1-picrylhydrazyl) scavenging assay and phosphomolybdenum assay. The antimicrobial activities of the extracts were evaluated against 13 microorganisms. Results: T. hypochionaeus var. hypochionaeus was showed the highest DPPH inhibition with 88.84% at 100 μg·mL-1. All of the extracts were exerted high total antioxidant activities 128.00- 243.13 mg AAE g-1) and seem to be a promising source of natural antioxidants. The phenolic contents in the extracts varied from 26.17 to 60.99 mg·g-1 as gallic acid equivalent. Chlorogenic acid, caffeic acid and p- coumaric acid were the predominant constituents. The methanolic extracts revealed promising antibacterial activities against most bacteria. No activity was recorded against yeasts tested. Conclusion: The polyphenolic constituents appear to be responsible, at least in part, for the extract’s activities. 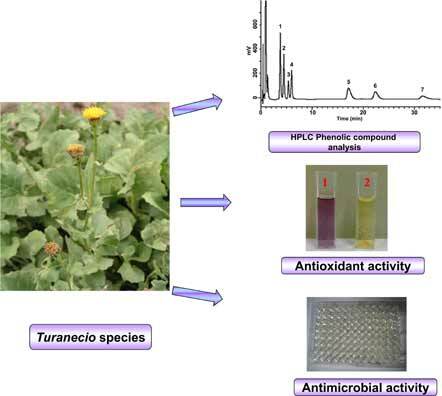 The present study confirms that tested Turanecio species contains significant source of phenolics have antioxidant and antimicrobial activities and may have therapeutic potential. Keywords: Antimicrobial activity, antioxidant activity, phenolic, Turanecio. Keywords:Antimicrobial activity, antioxidant activity, phenolic, Turanecio. Abstract:Objectives: In vitro biological activities of methanolic extracts of five Turanecio species have been studied.